The experiment was coordinated by SETI International (www.setiinternational.org), a new research and educational organization devoted to innovative approaches to astrobiology and the Search for Extraterrestrial Intelligence (SETI), including Active SETI, in which intentional signals are sent to other stars to evoke a reply. On six nights between October 29 and November 28, 2015, scientists searched for pulses as short as a billionth of a second at the Boquete Optical SETI Observatory in Panama, using a 0.5 m Newtonian telescope. The observatory's relatively small telescope uses a unique detection method having enhanced sensitivity to pulsed signals. If any hypothetical extraterrestrials had beamed intentional laser pulses in the visible spectrum toward Earth, the Boquete observatory could have detected them so long as they exceeded the observatory's minimum detectable limit. KIC 8462852 has puzzled astronomers because it shows irregular dimming unlike anything seen for another star. The anomalous light curve was measured using NASA's Kepler telescope, as part of its search for exoplanets. However, even though a planet the size of Jupiter would cause dimming of approximately 1%, the dimming observed for KIC 8462852 was far greater – up to 22%. Just as strange, the dimming didn't follow the regular pattern of a planet orbiting a star, but instead was unpredictable. The best explanation to date is that the dimming may have been caused by cometary fragments in a highly elliptical orbit around KIC 8462852, intercepting starlight at the same time the Kepler mission was observing it. 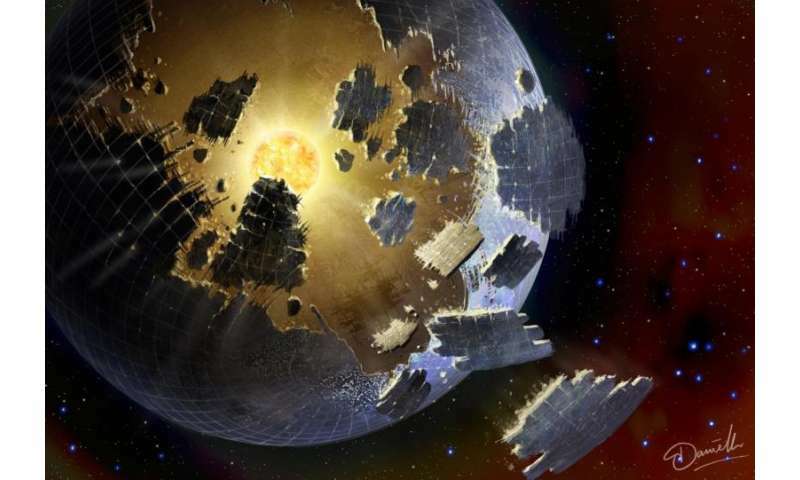 "Given the large distance to KIC 8462852, nearly 1500 light-years, any signal received on Earth today would have left the star shortly after the fall of the Roman Empire," said Marlin Schuetz, Director of the Boquete Optical SETI Observatory and an author on the paper. "We need a sensitive way to detect any laser pulses that have traveled that far," he added. "If some day we really detect a signal from an extraterrestrial civilization, we need to be ready to follow up at observatories around the world, as quickly as possible," said Vakoch. As a first test of this coordination, on three of the nights that optical SETI observations were made from Panama, KIC 8462852 was simultaneously scanned for narrowband radio signals using the Allen Telescope Array in northern California. As was the case for the optical observations, no signals were detected. So why would advanced civilizations want to communicate via a 3000 year delay? What a wasted effort. I suppose most of what SETI does is further nonsense. No intelligent alien would attempt such an inefficient means of communication. Either they have a better means, or they would not waste their time. SETI should take a look at crop circles, if they are truly interested in alien communication. ^ What he said. But furthermore, if they are crumbling apart they have bigger things to worry about than sending radio signals all willy nilly. That's one theory. On the other hand, those inhabitants around KIC 8462852 are so private that they don't want to be noticed, and they are building that Dysan Sphere to block even their sun from outside scrutiny so that they won't be interfered with while they go about planning the destruction of all intelligent life that wants to reach out and touch someone else. Be very, very careful. Good effort. It's safe to say you won't discover it if you don't look for it. Signals? Why do some folk immediately jump to the most ridiculous argument? Assuming they are beings. It is because they will not communicate via laser pulses. Humans think in such small terms. If they are in fact creating a dyson sphere then they are attempting to seal them self's off from the universe. There are so many better ways to produce large amounts of energy then this. I agree on the intentional communications part, which a directional laser would be, but looking for unintentional and isotropic radio signals has some merit. Earth could be discovered by those means some 100 light years out so it stands to reason that other civilizations who use or had used radio waves could be as well. So why would advanced civilizations want to communicate via a 3000 year delay? Would only make sense if they were extremely long lived (or metabolically/intentionally artifically slow). There are so many better ways to produce large amounts of energy then this. We've barely been looking at this star for 5 mins and already they are saying "no, definitely no ET there". It's ridiculous, even arrogant to think that because we can't detect them straight away then they obviously don't exist. Keep watching the star I say. I smell a desperate attempt to get more funding. That is the story of the SETI program. A Dyson Sphere, or a Ringworld, would be built to harness more of the star's energy to support a larger/richer population, not to hide, which would be futile. Such a civilization would have to be so old to have advanced to that level that their population might number in the trillions, which is what would be required for a massive project like a Dysan sphere to be undertaken. By that time also, they will have determined that contacting civilizations on other worlds invariably brings great misfortune. No, they want to hide. Just another dark matter ball. You think a technological advanced species would continue to multiply? Especially if they have (as close as makes no difference) immortality the entire reason for procreation falls by the wayside. Not to mention scenarios like post humanisms or group minds in which numbers are stable or even reduced down to one. In any case a pupoluation of a trillion still means that each individual would have about 100000 square kilometers at their disposal (positing a Dyson Sphere at 1 AU). To get to less than 1 person per square kilometer you'd have to step up to a 100 quadrillion people. Why? It's not like anyone has anything the other wants or needs at that stage. Disease, mostly. And incompatibilities too numerous to mention. This particular species multiply to increase their collective mass. They are six inches tall. That figures, the way life works. A massive undertaking like a Dysan sphere would naturally be the accomplishment of a diminutive race of humans six inches tall. It would seem some of our fellow posters are engaged in a circle jerk of mental masturbation right alongside the rubes looking for aliens. I'm rather disappointed that no one has mentioned that we may be witnessing the remnants of Alderaan. Was this a demonstration of your blondeness? Sorry about the 1 it was suppose to be a 5. The hypothesis of intelligent life on Manhattan is quickly falling to pieces. Careful observations with my binoculars reveal no evidence of smoke signals visible from Brooklyn.